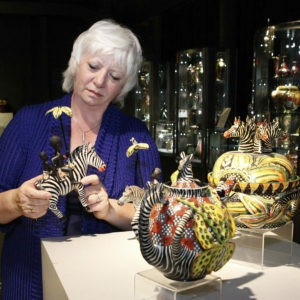 The Ardmore artists make zebra riding look easy but in fact, they are usually too aggressive to train. They kick and bite and their backs are not really strong enough to support the weight of a man. Nevertheless, there were numerous attempts to tame them in the late 19th century. Zebras were trained for performance at Ducrow’s early Victorian circus but apparently “entirely lost their spirit and vivacity, in consequence, assuming the humbled bearing of the common donkey.” By the way, a cross between a donkey and a zebra is known as a Zonkey! In Victorian times, Mrs. Alice Hayes rode side-saddle on a zebra trained by her husband. 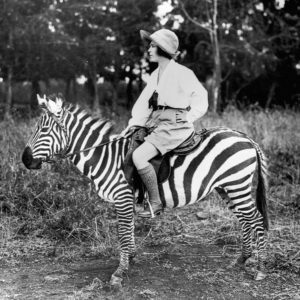 The American documentary film-maker and adventurer, Osa Helen Johnson rode a zebra in Africa during the 1920s. 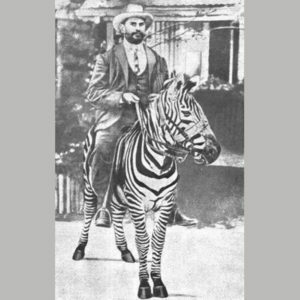 Dr. Rosendo Ribeiro, the first private medical practitioner to diagnose the bubonic plaque in Kenya, rode a zebra to visit his patients. 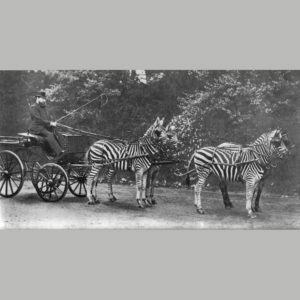 Perhaps the most successful zebra trainer was the eccentric zoologist, Lord Walter Rothschild of the global banking family. He trained zebras to pull his carriage and took his team to Buckingham Palace in London in 1895, just to prove it could be done. 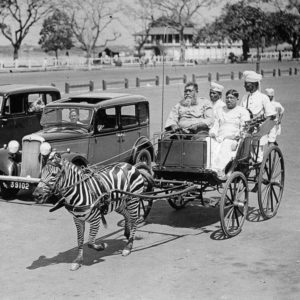 In Calcutta, a scion of the wealthy Mullick family bought a pair of zebras from the local zoo to pull his carriage through the streets. 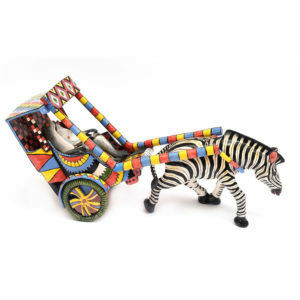 In a favorite Ardmore exhibit at WMODA, the African artists have substituted monkeys for the passengers in a zebra-drawn rickshaw. The streets of Durban were once full of rickshaws, drawn by Zulu boys. 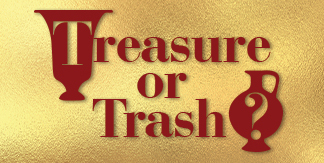 First introduced in 1892, there were more than 2,000 at work in the early 1900s. 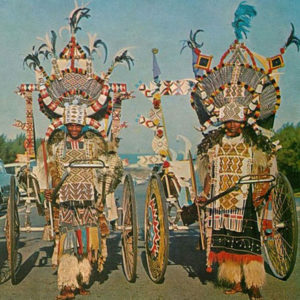 The puller’s outfits became more and more outrageous to attract the custom of the tourists with a combination of feathers, quills, and traditional beadwork. The horns symbolize that the pullers are as strong as an ox. Only around 20 Zulu rickshaws now ply their trade on the Durban ocean front. 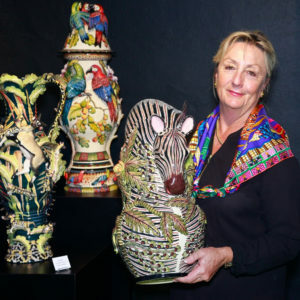 The Ardmore artists have also produced some striking Zebra jugs inspired by French Majolica jugs from the 19th century that Fée discovered on her travels. She is pictured with a monumental Ardmore example on her last visit to WMODA.